In a healthy knee, smooth cartilage covers the ends of the femur and the tibia. The cartilage works as a cushion between two of them and allows the bone ends to move over one another, a painless movement. Muscles and ligaments around provide side to side stability. A synovial membrance line the joint and produces synovial fluid which lubricates the joint. Dr Saurabh Goyal offering knee replacement treatment in many orthopedic centers which are located in Ahmedabad, Udaipura, Jaipur, Ajmer, Kishangadh, beawar, jodhpur and all over Gujarat and rajashthan. If you are surfing from the knee pain your serch end here consult Dr Saurabh Goyal for knee and joint replacement treatment. Osteoarthritis, rheumatoid arthritis and post traumatic arthritis becomes reason for knee joint deterioration mentions the point that a total knee replacement is required for patient’s ability to perform daily activities. 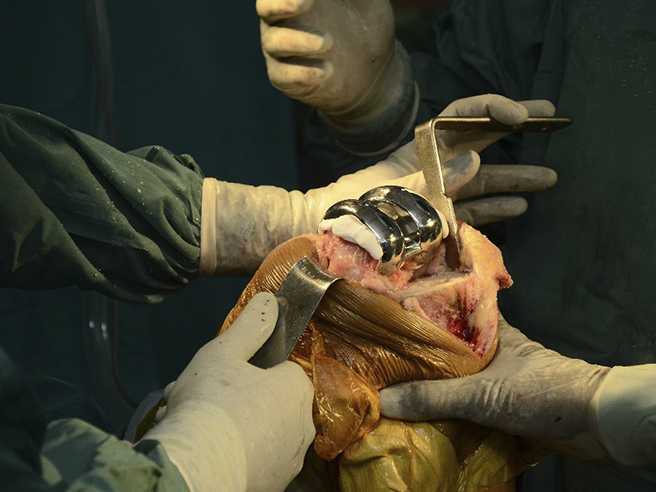 Orthopedic surgeons who are specially trained in Joint replacement surgery perform knee replacement surgery after assessing the patient clinically and radiologically. This parameter helps to decide if their patients require this surgical procedure to improve knee functionality. A total knee joint replacement or total knee arthroplasty is an operation to remove an impaired knee joint and replace it with an artificial joint. The aim of the surgery is to give the relief from pain and restore functions of the joint. A knee surgeon will assess the need for a knee replacement after considering your medical history, physical examination and X-rays of the damaged knee. A knee replacement is a major operation and there are lots of things you should discuss with the surgeon which includes the risks and benefits of surgery.